I’ve been hoarding this fabric for 2 years. It was drawn and printed by my talented friend Ariel and I love it. 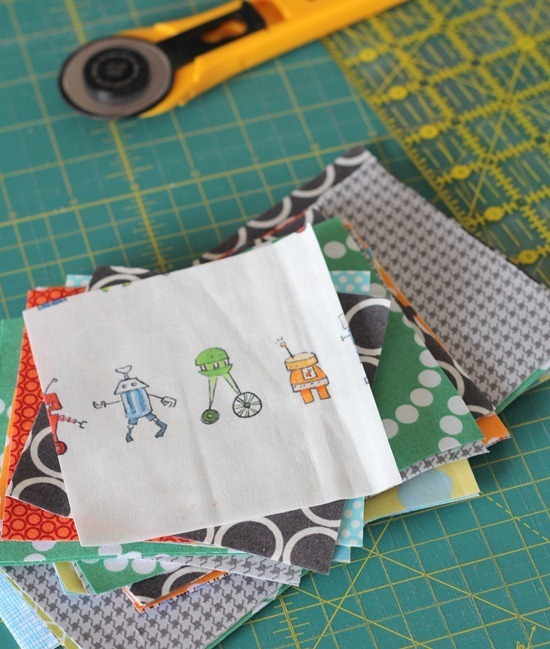 I made a quick baby quilt for a friend and those little robots were perfect for this pattern (the road trip quilt tutorial). I especially love the colors in this one. I wasn’t so sure about them when the fabrics were being cut, but once it was sewn together I fell in love with the orange. Now to find a backing…and piece some batting scraps because I’m all out of big chunks. I sure do love sewing boy quilts. Who says boys aren’t fun to sew for?? Not me! ps. I loved reading your comments from my “Modern Quilting?” post. I think most of us agree that it doesn’t matter what you call it…we just like to quilt! love this one Allison! 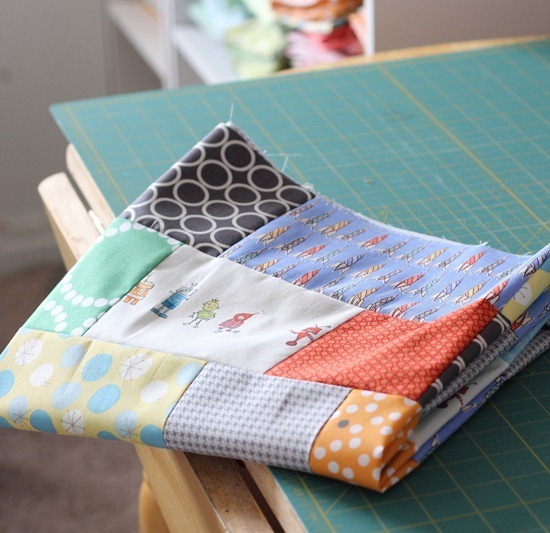 I have the MOST fun making boy quilts….. I think there is a lot of reward in them because there are way more fabrics made for girls than boys…. I enjoy making boy quilts too! Love the cute little rockets and spaceships! Great fabric and great choice for a lucky little boy! I love those robots!!! They're wonderful. I love what you did with them too, it's a wonderful boy quilt. I like sewing for boys too, there are some great fabrics out there for them now too. It's going to be a wonderful quilt! Love the cute robots, what a great boy's quilt! Very cute! The road trip pattern is one of my favorites. I like sewing for boys, too. I think it takes a bit more…work, since the supplies aren't as "obvious". Frills and lace are everywhere. Sharp lines and color contrasts and neat boy stuff…you have to make it yourself! Love it, great layour and fabric, yes, perfect for a boy and it will be treasured. 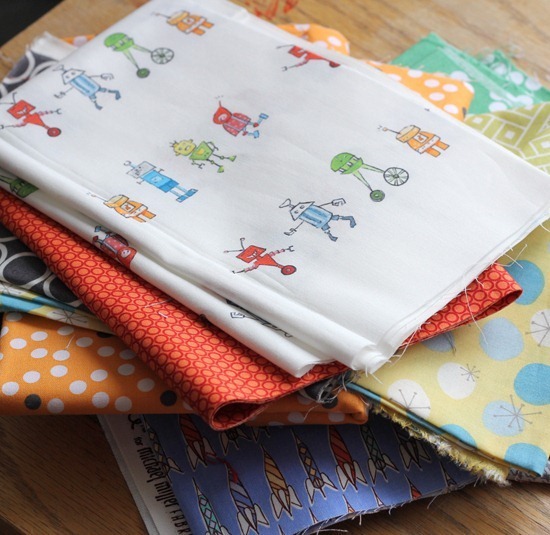 What cute fabrics and I agree with you… boys are fun to sew for! It's such a wonderful boy quilt! The pattern is great. I need a baby quilt soon. Thank you for the tips. Love it! I made a quilt top with this tutorial of yours using Children at Play and love it. This is a good reminder t get some backing ready and quilt it! Love the quilt and the robot fabric. Boys are great to sew for. Very very cute. I don't have too many babies in my circle of friends usually, now three have entered my life…baby blankets are fun and you know they will be used. That is AWESOME robot fabric! 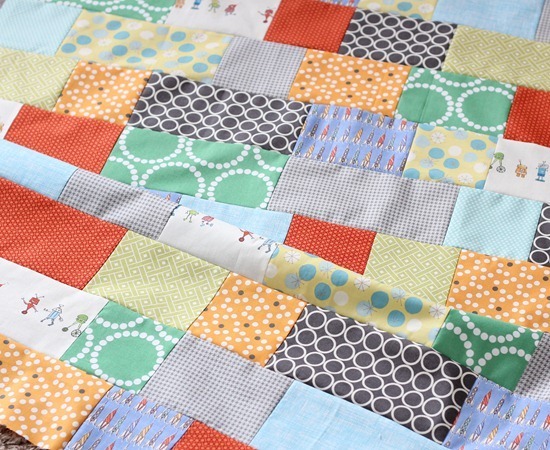 No wonder you hoarded it for so long :) IMO boys quilts are the most fun to make…I lean towards geometric fabric in blues and greens over a pink floral or damask any day! Love how this one turned out!! I made the pillow with a tree as you showed in your blog, and I mencioned your blog in mine. I love the fabric in this one. I know it’s for a boy, but my daughter would love the robot fabric. I love the fabrics with this pattern. It looks amazing. What adorable robot fabric. And not only are boys fun to sew FOR, they are fun to sew WITH. My 4-year-old grandson and I have been making a 16-patch pillow top. He is fascinated with all the cool gadgets on my machine, and I have taught him about right side/wrong side of fabric and the value of a design wall. Fun times! I have 2 girls, but I just love doing baby boy quilts! The fabrics just seem more fun and diverse. There are really a lot of fun fabrics for boys – looks great. omg girl this is just amazing!!! oh i miss my sewing machine sooo much!!! Wow, I LOVE this quilt! It's perfect!